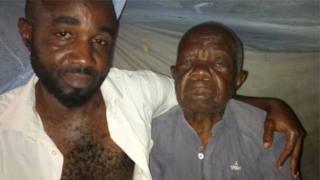 Celestine Egbunuche na 100 years old man wey dem claim say na di oldest prisoner for Nigeria wey make pipo dey beg make goment free am. Im don spend 18 years inside prison afta dem convict am say im organise to kill pesin. Celestine and im son Paul Egbunuche wey dey 41 years be prisoners for Enugu Maximum Security Prison for south-east Nigeria sake of di same offence. "I dey write dis WAEC to become lawyer for oda prisoners"
Dem accuse dem say dem hire pipo wey go kidnap and kill one man sake of say dem dey drag land for Imo state, south east Nigeria. Di old man no dey fit tok again and im dey behave like pesin wey dey sick, na im son dey answer for am. Na for June 2000 dem arrest dem come later convict dem and sentence dem to death. Paul say dem dey innocent of di accuse. E say im papa no dey tok much again and no dey understand im environment again. "If you ask am something, im go ansa anoda tin. Doctors tell me say na sake of im age, im just dey do like small pikin". "E get some times wey im go ask me wetin all dis pipo (inmates) dey do here?" Paul say na im dey take care of im papa inside prison since im health begin dey bad. E get diabetes and im eye no dey see well again. "I just dey manage wit im food, unripe plantain and di officials dey give am some drugs". Paul and im papa dey share di same cell with oda prisoners wey get death sentence. Dem no dey togeda wit oda prisoners. "Wen I wake up in di morning, I go boil water go baff am" na so Paul tok. "I go change im clothes, den prepare food for am. If dem open di cell, I go cari am go outside make sun touch am". Paul say oda inmates dey help am somtimes to take care of im papa. Na afta Papa Celestine do im 100 years birthday for prison tori pipo write tori about am. Pipo begin ask kwesion of how many years pipo fit stay for prison afta dem collect death sentence. Figures from Nigerian Prison Service show say more than 2000 pipo dey for death row for Nigerian prisons, and plenti of dem dey wait many years for dia execution. Pamela Okoroigwe wey be lawyer for Legal Defence and Assistance Project (LEDAP) say "you go fit find pipo wey don spend 30years for death row, e dey common". "Govnors no dey too gree to sign death warrants and dem no ready to give pesin pardon, na im make we get plenti pipo for death row". Franklin Ezeona wey be president for Global Society for Anti-Corruption (GSAC) say dem don cari Pa Egbuchune mata give goment and Attorney General for Imo State Miletus Nlemedim don recommend make goment pardon di man, but di mata dey wait for Govnor Rochas Okorocha to approve am. Celestine pikin Paul say "e go good make dem release am, so dat im go fit die in peace for im house instead of to die inside prison.